A suspected bomb discovered by workers building a Costa coffee shop was a World War Two practise device. Police were called at around 11:00 BST to the site on Victoria Road in Milford Haven docks, Pembrokeshire. 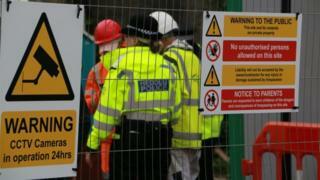 They cordoned off the area while bomb disposal experts examined the suspicious object, unearthed by construction staff. Dyfed Powys Police said: "The device that was full of concrete and never posed a threat as it was inert." The area was closed off and public warned to stay away for three hours. The device was later taken away by the bomb squad. Reality Check: How common are WW2 unexploded bombs? How dangerous are unexploded bombs? Unexploded bombs: How common are they?